“The key to accelerating discoveries in science or the next tech breakthrough will be dependent on our ability to bring fresh perspectives to STEM fields,” says Priscilla Chan, co-founder of the Chan Zuckerberg Initiative (CZI). Now, CZI has turned to UMBC for a model of how to make that happen. CZI announced today that it has awarded $6.9 million to support a unique partnership to replicate UMBC’s Meyerhoff Scholars Program at UC San Diego and UC Berkeley. The UMBC Meyerhoff program, founded in 1989, is recognized as one of the most effective models in the nation to help engage and retain underrepresented students pursuing undergraduate and graduate degrees in STEM fields. Program participants have already earned 300 Ph.D. degrees, 130 M.D. degrees, 54 M.D.-Ph.D. degrees, and 253 master’s degrees. Hundreds more are currently pursuing graduate degrees. Abby Cruz ‘18, a Meyerhoff affiliate and MARC U*STAR Scholar, works in Fernando Vonhoff’s biology lab. These achievements are particularly striking in a national context. 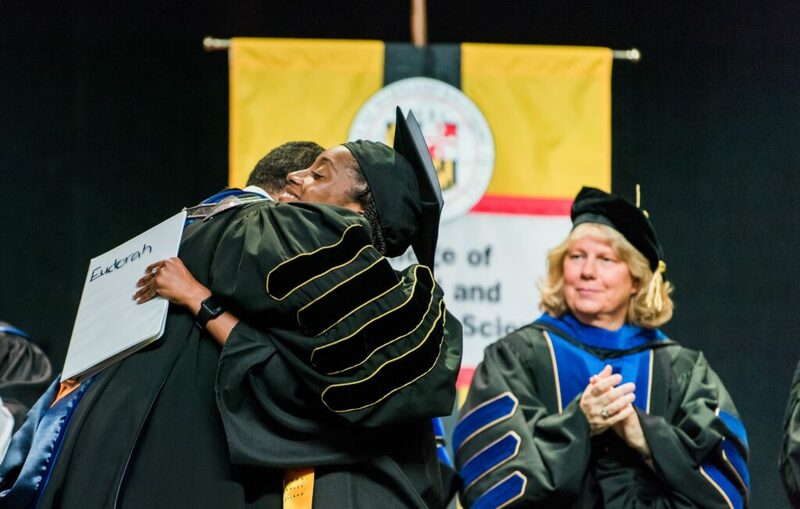 UMBC graduates more African American students who go on to earn dual M.D.-Ph.D. degrees than any other college in the U.S.—a credit to the Meyerhoff program model. UMBC is also second in the nation when it comes to graduating African American students who go on to earn a Ph.D. in any STEM field. 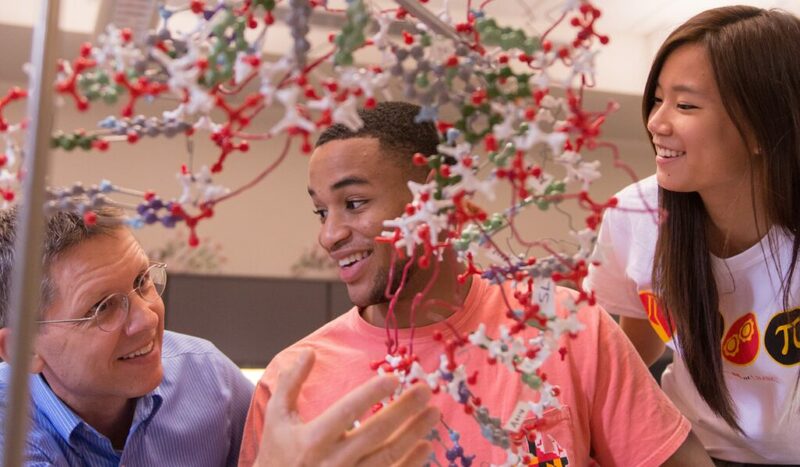 Michael Summers (left) with two of the students who have worked in his lab, which focuses 3D structures of protein components that make up HIV-1. The University of California system is the largest undergraduate and graduate educator of underrepresented and low-income students in the country within the Association of American Universities, and UC Berkeley and UC San Diego are major sources of top talent for Silicon Valley and STEM fields more broadly. The CZI support announced today will enable UC San Diego and UC Berkeley to apply many of the strategies successfully used at UMBC. These include outreach to high achieving underrepresented high school students, robust research experiences, team learning, peer counseling, intensive advising, preparation in the summer before matriculation, and engagement with students’ families. Informed by UMBC’s own approach to measuring the impact of student support initiatives, UC San Diego and UC Berkeley will provide rigorous data to measure the effects of their new programs over the five-year grant period. In this way, they hope to determine what approaches work best to create a welcoming and supportive environment for underrepresented groups, and ultimately to improve education for all in STEM fields. 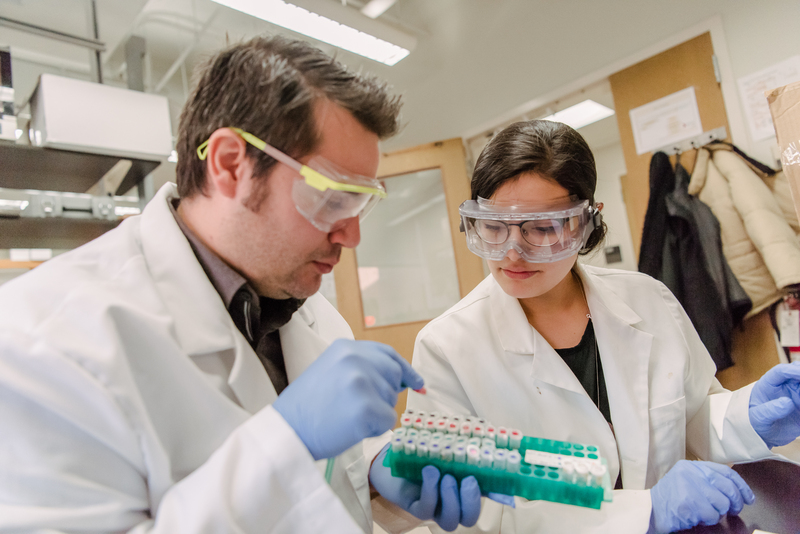 As UMBC recognizes, these findings can also help a university support students beyond STEM, in any field, as they work to discover and fulfill their potential. UMBC Meyerhoff alumni pursuing graduate degrees at UC Berkeley and UC San Diego are particularly excited to see this new partnership grow. President Hrabowski congratulates Meyerhoff Scholar and valedictorian Eudorah Vital after she delivers commencement remarks, May 2018. “Seeing a version of the program come to Berkeley is exciting because it means there is another initiative to increase the support for students of color. It means building and extending the community that wants to see us in academic spaces,” says Robyn Jasper ‘17, M25, biological sciences, who is currently a Ph.D. student at UC Berkeley in plant and microbial biology. “Being a Meyerhoff Scholar has connected me and continues to connect me with advocates for my personal growth and institutional change,” she shares. 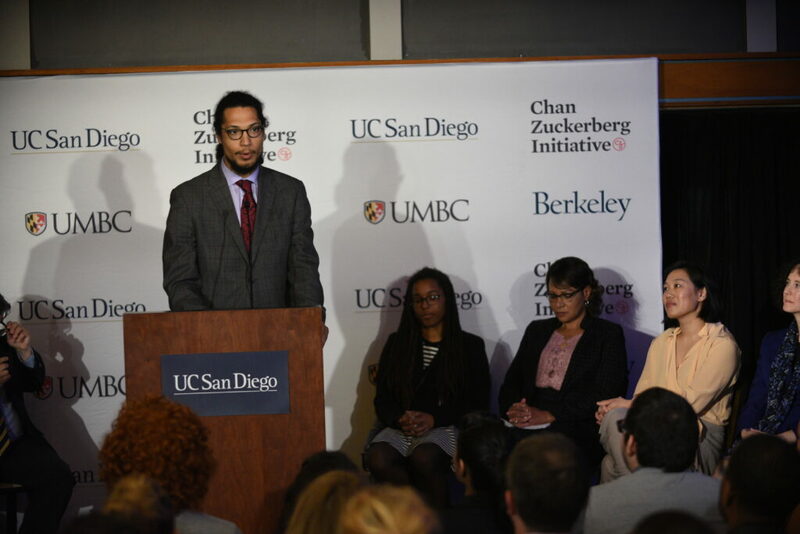 Rocky Sison ’13, M21, speaks at a press conference in California announcing the Chan Zuckerberg Initiative support for replication of the Meyerhoff Scholars in the University of California system. Photo courtesy Chan Zuckerberg Initiative. Now, UMBC’s Meyerhoff Scholars Program model will reach more people than ever before, reshaping the future of STEM in California and the nation, and unlocking new opportunities for students. Featured image: Naomi Mburu ’18, chemical engineering, a Meyerhoff Scholar and UMBC’s first Rhodes Scholar. She is now studying nuclear engineering at Oxford. All photos by Marlayna Demond ’11 for UMBC.